On side B of the Best of 2015 episode of ignorant Bliss, my collaborator Sean Causley and I aka Longboxes on 22s talk about our favorite television shows and some thoughts on the events in 2015 and sports in Washington DC. We also talk about our convention plans for this year aka the Longboxes on 22s Convention Tour. Also in the episode you’ll hear from Shawn Pryor of his Top 10 of 2015 and Jared K. Fletcher of his Best of 2015. Enjoy! 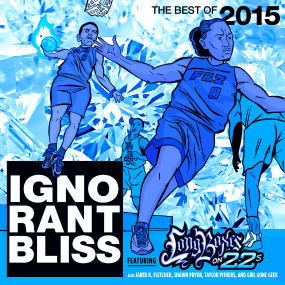 On side A of the Best of 2015 episode of ignorant Bliss, my collaborator Sean Causley and I aka Longboxes on 22s go through what we feel was some of the best music of the year and run down our combined Top 10. Also in the episode you’ll here Taylor Pithers’ Top 5 in Grime music and Jamila (aka Girl Gone Geek) Top in Geek reference rap bars. This episode I talk with my fellow Punch Drunk Critic and personal “Peggy Olsen” Rocky Hadadi about the first half of the final season of Mad Men. Enjoy.